In my preparation for a big trip to the grocery store today, I was searching through recipes on my food blog (don’t get excited…I haven’t updated it in ages! ), and came across this recipe. It’s perfect for this week. Chilly + wet outside = perfect crock pot weather. Not only is this time of year ideal for crock pot cooking, but I always welcome a quick and easy….but tasty….meal that the whole family will eat. And they WILL eat this. 1. Place onions in bottom of slow cooker. 2. Combine brown sugar, soy sauce, ketchup, honey, vinegar, garlic, ginger, and red pepper in large bowl. Add ribs and turn to coat. Place on top of onions in slow cooker. Pour sauce over meat. 3. Cover and cook on low 5-6 hours. 4. Place ribs on serving platter. Sprinkle with sesame seeds and green onions. Serve sauce on the side. Yummy served with rice and veggies! I have to try this! Just reading the recipe made my mouth water! Really digging your blog. Following you via RSS feed and Network Blogs! Absolutely! I think it would work just fine with chicken! Thanks for all the support. You rock! 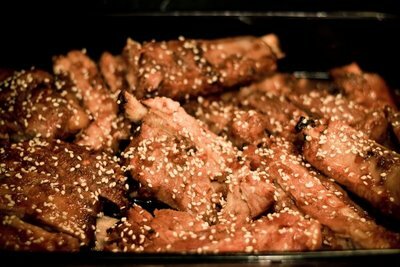 Yummy pork ribs! Good luck on the winning avocado recipe. YUM!! Thanks for the recipe. Sounds like a perfect meal for me to cook for my kids. It’s raining over here too. Yummy! Are we still up for Aldi this week?